Hotel developers in and around Orange County are seeing double. 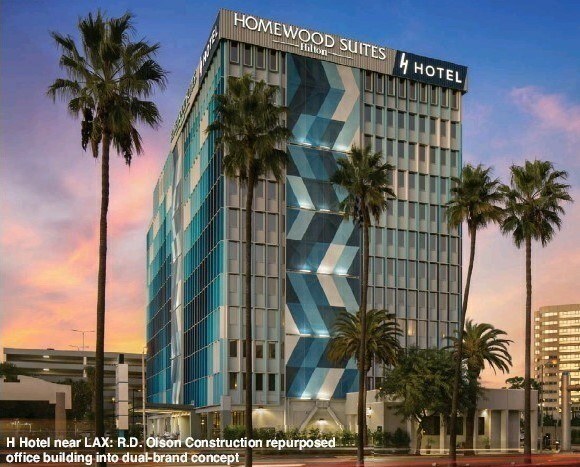 Area hotel construction—already in overdrive, especially in the Anaheim resort area— has been accelerating around dual-brand hotel projects, those featuring two hotel properties within the same brand company, such as Hilton or Marriott, at the same site. On some projects, the two hotels are connected, while others put them next to each other on the same grounds. The trend is national, according to a recent report by Los Angeles based hotel consulting group HVS. “Just as the early 2000s realized the proliferation of the boutique hotel concept, the second decade of the new millennium will arguably be known for the growth of the dual-brand hotel concept,” the August report said. It’s “one of the top three topics” in the industry, said Bill Wilhelm, president of Irvine-based R.D. Olson Construction. The other two hot topics, according to Wilhelm, are figuring out the stage of recovery the hospitality industry is in, and how it can better attract employees in a time of high employment. “In the last four to five years, in the hospitality industry, this has really taken off,” he said of the dual-branding model. Anaheim, Orange Wilhelm’s construction firm is plenty familiar with the dual-brand phenomenon. In Anaheim, it’s working with locally based developer Nara Investments to build a 125-room Hilton Garden Inn, which will be connected to a 98-room Hilton Home 2 Suites. Ground recently broke on the six-story property immediately west of the Santa Ana (5) Freeway on Manchester Avenue. It’s being built on the former site of a 108-room Quality Inn that was demolished to make way for the new project. The developers also own a nearby Holiday Inn Express. The site, about half a mile from the entrance to Disneyland, will feature a “unique Kids Splash Pad water park,” according to marketing materials for the project, which was designed by BRR Architecture and Studio 11 Design. About two miles away in Orange, Wilhelm’s firm is working with DCSG Development of Pasadena on a dual-brand project just east of the 5 Freeway on West Chapman Avenue and along the Santa Ana River. The project will feature a 194-room Courtyard by Marriott hotel and a 112-room Residence Inn at the same site, which was previously home to a Motel 6. Construction is due to kick off in about two months. It was designed by Architects Orange and Level 3 Design Group. Costs, Synergies Developers like the dual-brand concept largely for cost and efficiency savings. “If you put can put two [hotels] on the same property, it can reduce operational costs and back-house costs,” Wilhelm said. That typically means one set of meeting rooms, one swimming pool, and one main kitchen. It also typically means one set of entitlements. From a marketing perspective, the concept can be a good loyalty builder, introducing visitors at one brand to another type of brand they might not have been familiar with. The concept also mitigates some demand risk. “If you’re a developer, maybe a 300-key property [of the same type] doesn’t make sense,” Wilhelm said. But a mix and match of a boutique brand; select-service; limited-service; or extended-stay property could be justified if each has 100 to 150 rooms, he said. Tustin Model R.D. Olson Development, the Newport Beach-based development arm of Wilhelm’s construction company, took on its first local dual-brand project when it opened Tustin Pacific Center in 2013, a two-hotel project next to the Costa Mesa (55) Freeway targeting business travelers. The project features a 145-room Fairfield Inn & Suites and a 149-room Residence Inn, both by Marriott. The hotels, which R.D. Olson Development sold in 2015 as part of a $103 million portfolio sale, are on separate sides of the roughly 7.5-acre site. Today, integration is more likely than two stand-alone projects. “You’re seeing different [models],” said Wilhelm, whose firm is building a dual Marriott-branded project along the water in Marina Del Rey in Los Angeles County, and opened a 290-room H Hotel a year ago near Los Angeles International Airport that features a Curio by Hilton and a Homewood Suites. Nowadays, you might even see a property that swaps hotel type on alternating floors, or two flags on the same floor, Wilhelm said.